The majority of Graves' patients have a mild and nonprogressive ocular involvement that does not require any specific or aggressive treatment, also because non-severe GO often tends to improve spontaneously. When evaluating a patient with TED, two basic questions have to be addressed. First, does the patient needs treatment for TED and, in a positive answer, which kind of treatment is indicated. Fig. 1. 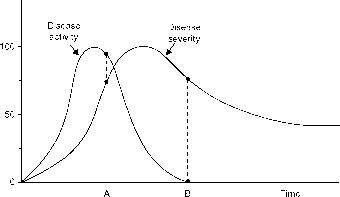 Hypothetical relationship between disease activity and severity in the natural history of TED . Decrease in eye movements of 5 degrees or more in the last 1-3 months spontaneous retrobulbar pain pain on eye movements eyelid erythema conjuctival injection chemosis swelling of the caruncle eyelid edema or fullness with an evident reduction of visual acuity. It has to be remembered that immunosuppression treatment is effective only in patients with active disease.